Libraries are back in the news. Or to be more precise: old news about school libraries is getting some new attention. And it’s evidence of the power of our grassroots movement as we literally change the conversation here in Southwest Pennsylvania, keeping the focus on equity in learning resources for our students. Just yesterday the Post-Gazette picked up this story and it has already been shared more than 950 times on Facebook and Twitter. [Post-Gazette, 11-26-12] The fact that the paper’s education reporter (and the editors) chose to run this article now, more than a month after the study came out, suggests that they see continued public interest in the topic – interest that we have helped to cultivate by keeping the spotlight on equity issues in school libraries. And if the Post-Gazette thought people would take notice, they were right: the number of people sharing the story on social media is many, many times larger than a typical education piece and it has generated a vigorous on-line discussion in the comments section. 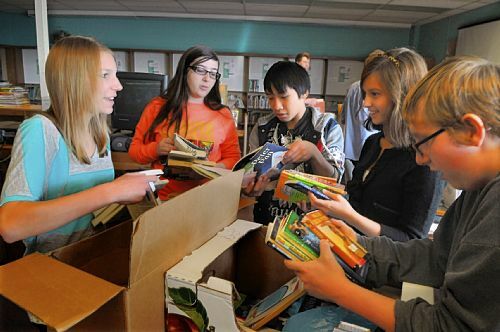 Baldwin High School students Daria Och, Sarah Berardine, Jackie Nguyen, Ali Marx and Matt Doyle sort through books they helped collect for the library of Pittsburgh Carmalt. Photo source: Darrell Sapp/Post-Gazette. These stories not only highlight the continued impact of our grassroots movement, but also point to the underlying equity issues. As we’ve said many times, it’s great to have all those new books and a space open for classroom teachers to take their students when time allows, but without a full-time librarian in each of our schools, we are still short-changing our kids. Professional librarians do far more than check out books. They get to know hundreds of students in their schools; they work closely with classroom teachers to design lesson plans; they teach critical digital information searching skills; they run reading clubs, and much more. As this most recent study clearly found, librarians are even more significant for our most struggling students, yet these are often the very kids forced to go without books, staff, or space. As we’ve seen with these latest draconian state budget cuts, libraries and librarians are some of the first learning resources that get the axe when districts are forced to make tough choices. And Pittsburgh is hardly alone: last year 56% of all public schools in Pennsylvania did not have a full-time librarian. [Post-Gazette, 11-26-12] Yet people care about their libraries and believe that children should have access to their resources. In fact, it was the threat of losing school librarians that catalyzed many in this grassroots movement into action last fall. Perhaps that should not come as a surprise here in the birthplace of Andrew Carnegie’s free public libraries, where local residents actually voted to raise their own taxes last fall to support the system. In any case, libraries offer a tangible and crystal clear example of the challenges facing our public schools. People understand empty bookshelves and can wrap their heads around the fight to fill them more quickly than digesting the policy weeds of state politics. But libraries also offer the perfect entrée into understanding the consequences of state budget cuts and decisions made by legislators far away in Harrisburg. That’s another reason why keeping the library story in the public dialogue has been so important for our movement. 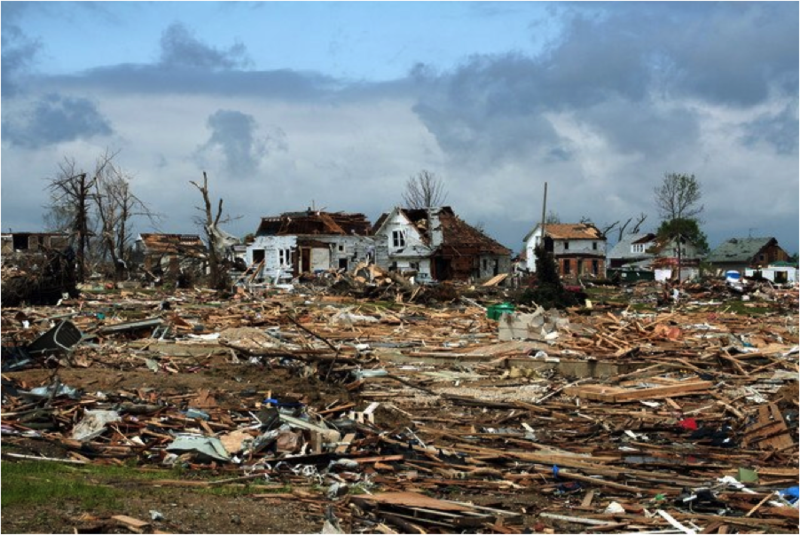 Parkersburg, Iowa in 2008 after the F-5 tornado leveled the town. Photo source: AlteredStars / WunderPhoto. And speaking of donations to Manchester: Penguin Bookshop in Sewickley, PA gave three enormous boxes of brand-new, high-quality, hardcover children’s books. Sheila points out that they received “absolutely nothing from us” in return, yet Amazon.com has made over $13,000 from our Wish-List book drive and so far not responded to our requests for a single donation. (The fact that all our volunteers have been paying full retail prices benefiting a large corporation also points to problems arising from the District’s decision to eliminate a city-wide library coordinator: these books would have cost far less under contracts we previously had with school book distributors.) Perhaps if you are doing some holiday shopping this year in the Sewickley area, you might consider dropping into the Penguin Bookshop with your business – and tell them thanks for supporting public education. Meanwhile, give yourself a big thank you, too, for keeping school libraries in the public eye where they can tell our story. This is how we know the grassroots is working. The Manchester Miracle’s best part is how it has brought us together. Today I met with a formidable, beautiful, capable activist mother and professional from Manchester who now wants to support families at Pittsburgh Colfax– a strength and life line running from Manchester to the East End. This displays the gorgeous democracy a grass roots movement like Yinzercation is. The best of humanity running like an umbilical cord across rivers, neighborhoods and racial lines. Viva la Revolution! Appreared in Philadelphia Daily News Op-Ed on Monday, November 27, 2012. Click below link to share. The Post-Gazette editorial board also wrote about this study in today’s paper. The story goes on! It has clearly hit a nerve. Meanwhile, some pretty horrifying comments about public education and librarians have appeared under the original article. If you have a chance, you might want to drop by and make a response in support of public schools. The story has already been shared over 1,000 times and continues to get a lot of attention, so it’s a great place to be vocal about our movement. Thanks!